The Downey Beat reports the developer of the Tierra Luna Marketplace has agreed to pay the city $100,000 to exclude a life-sized mockup of the space shuttle from its 77-acre property. When the city sold the NASA site to Industrial Realty Group in 2003, the contract required IRG to keep the 122-by-78-foot model on its property. But the City Council on Tuesday will consider taking a $100,000 payment from IRG to take the fake shuttle off the developer’s hands. The city will get the money if it finds a location for the shuttle by June 1. According to the article, city officials have talked about storing the shuttle near the Columbia Memorial Space Center or lending it to a museum in exchange for other exhibits. 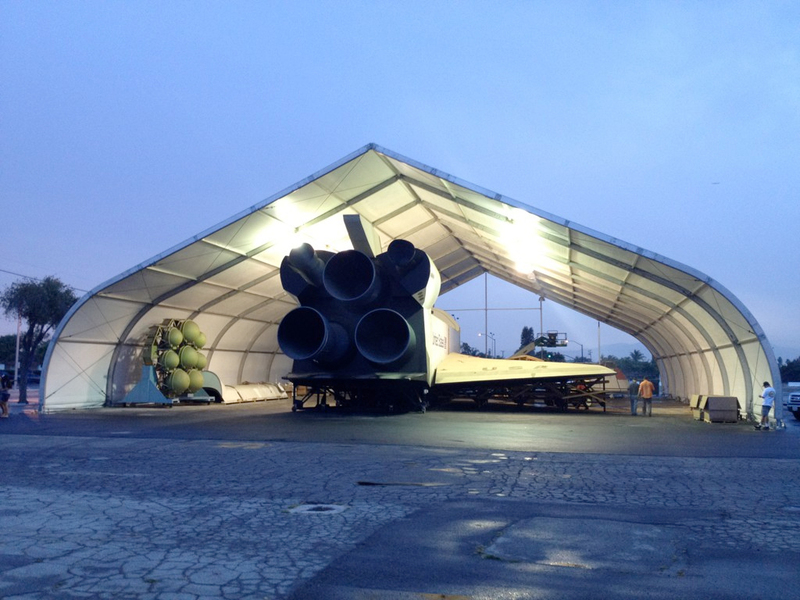 The Downey beat reports that the Downey City Council is expected to approve the temporary relocation of the space shuttle mock-up to a storage facility on the Downey Studios parking lot. Moving the shuttle and storing it for a year will cost about $157,000, according to a report from the city. Some $100,000 of the cost will come from IRG, and the rest will come from a federal fund named Community Development Block Grant. The city will also be responsible for upkeep and repairs of the site. IRG will lease the new space to the city for $1, and it’s giving the Downey two years to find a permanent home for the giant piece of space history. I had never heard of this before but found a sort-of-recent shot of it here. Griswold Conservation Associates restored the mockup in 2003 to preserve it for future display. Their report documents their work and includes many more interior and exterior photos. I wouldn't exactly call what Griswold did a "restoration" as what they did was to carefully take the major sub-assemblies apart piece by piece to move it to a spot on the Downey facility that wasn't being demolished for temporary preservation (the area where it sits these days and where it has to be moved from). The recent photo shows the area where they stored it under a Tyvek "tent" of sorts. 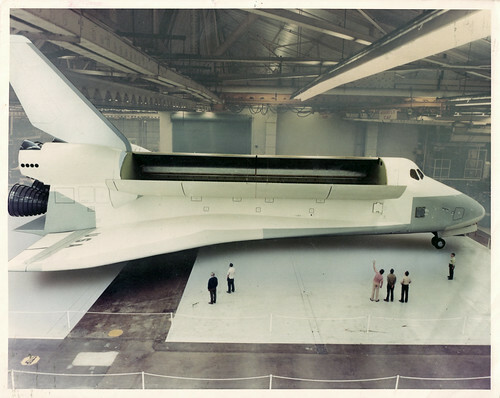 The mockup after its original unveiling had most of its left wing and the top part of its tail removed (and both items probably got recycled) when it got put in its final spot in the Downey plant in the early 1980s (likely when it got its repaint). But the rest of it remained pretty much intact with only cosmetic paint changes and some minor equipment retrofits. If I recall correctly, the vertical tail was not real (because the ceiling was too low for it) and only painted into the photos. Very interesting, looks like a beautiful model. Does anyone know the backstory... Why was it built? Was this just a display piece or was it built by NASA for some testing purposes? Is it an indoor model like the FFT, or an outdoor model like Explorer? It's a full-scale mock-up that was built in 1972 by Rockwell International (now Boeing) as part of the original space shuttle Request for Proposals process. When NASA awarded Rockwell the contract, the mock-up was kept on site and became the hands-on model for much of the shuttle's design. Each time a new instrument was built, it was placed into the mostly plastic and wood panels to make sure it would fit properly with the existing structure. Model payloads were fitted in the cargo bay; it even has an aluminum (and non-functioning) Canadarm. The mock-up only has one wing because, of course, two would be redundant for a bird that wasn't flying anywhere. 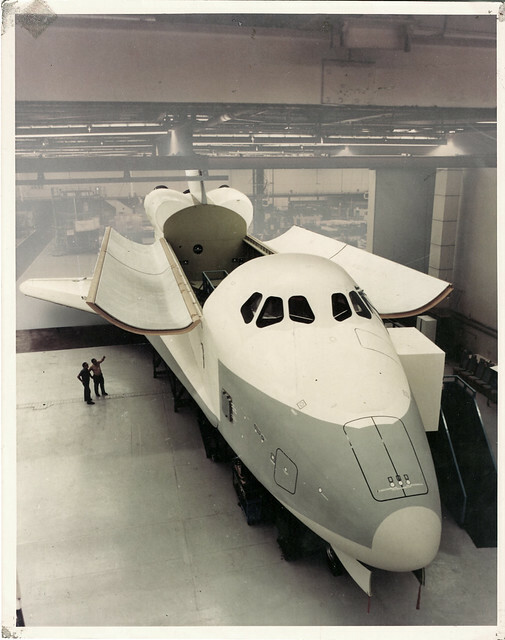 Most major aerospace projects have full size engineering mockups made and shuttle was no different. Even project Apollo had that done (as there is some archival footage showing workers building CSM mockups out of plywood in the days before NAA started making boilerplates out of metal). You tend to see it done more with DoD projects, such as military aircraft. Mockups serve more than one purpose. On one side, they are 3D renderings of the engineering drawings for the purposes of fit checks and the like. But early on they also usually serve as a sales tool as customers and government officials can get a chance to inspect the item up close. And believe me, a full size 3D mockup can do the sales job a lot better than just sticking some 2D images on posterboard and saying "See, this is what it will look like if you let us build it". Mockups are expensive to make though, so large complete ones aren't seen as often. But if a company has the finances to build one, they will. Here is some more history: The mockup which had no name DID once have two wings and a tail and was outside of Building One in 1973-74 time-frame. She also had a mockup reusable earth resources satellite that was later sold in the salvage yard. The orbiter was kept current until 1990, even to the post-Challenger modifications. The city of Downey was given the mockup when NASA left the site in 2000. It has the unofficial name "Downey" for the explorer and first California Governor — John Downey. I think that Downey mockup appeared on the cover of the November 1974 edition of "Popular Science" magazine. Before Columbia launched on the first space shuttle mission over 30 years ago, before Star Trek fans campaigned to rename the prototype shuttle after the Starship Enterprise and even before the last of the Apollo astronauts left their bootprints on the moon, there was a full-size space shuttle in Downey, California. That mockup, largely overlooked until recently, still exists and is about to go on public display near where it was first built in 1972. I haven't been told officially, but a politician has said that next Thursday (July 12), the shuttle mockup will be moved over to its pad next to the Columbia Memorial Space Center in Downey. This is the first time since 1974 that it has been outside. The city is throwing a party to celebrate the move with entertainment and activities for children. The public is invited to see the move. 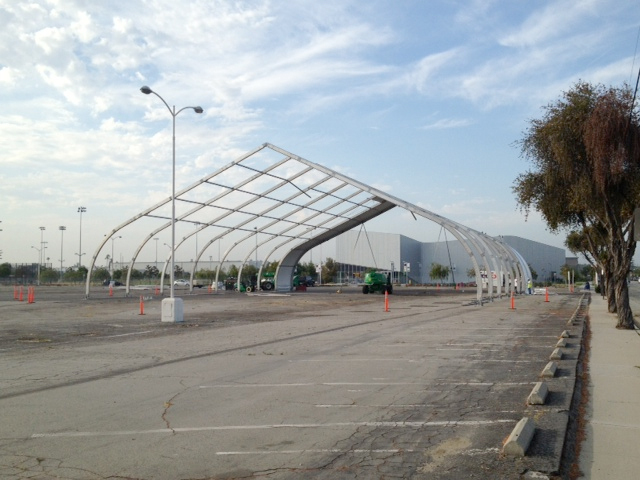 The first section should arrive in the tent area around 11 a.m., and the city is holding a special ceremony at noon. The much anticipated move of the original full-size Space Shuttle Mock-Up is scheduled to take place on Thursday, July 12, 2012. Built in 1972 by Rockwell International, the 122-foot-by-78-foot Shuttle will be moved from its current warehouse location to the Downey Studios parking lot where it will be housed under a temporary tent for public viewing. The City will host a special event during the day to celebrate the relocation of the Shuttle. The event will take place at the Downey Studios parking lot, 12214 Lakewood Boulevard, from 10:00 a.m. – 4:00 p.m. and will feature entertainment, interactive activities for children, and a special ceremony at 12 noon. The public is invited to attend and view the actual move of the Shuttle as it is transported to its new location. The first section of the Shuttle is scheduled to arrive in the parking lot at approximately 11 a.m. A designated area will be sectioned off for the public to view the move of the Shuttle from a safe distance. Parking will be available around the neighboring area, including along Columbia Way and Steve Horn Way. As the engineering birthplace of both the Apollo Program and the Space Shuttle, the former NASA/Downey site played a vital role in the evolution of space flight and exploration. The Space Shuttle Mock-up is owned by the City of Downey and has the distinction of not only being the first full-size Space Shuttle ever built, but it was used for two decades for detailed engineering fittings and testing. “We are excited to have this historic shuttle on display here in Downey. 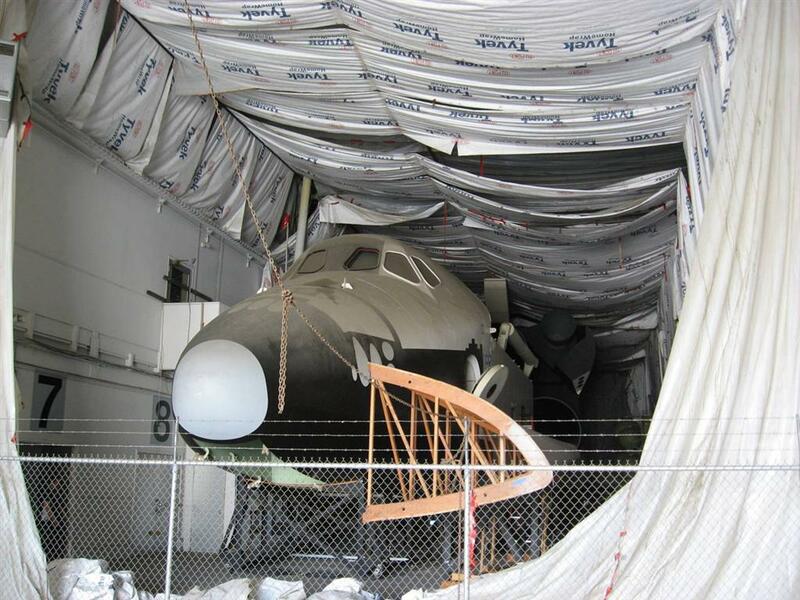 Our City is proud to have such a rich Aerospace history and we hope that this is the first of several steps to getting a permanent home for our Mock-Up,” said Mayor Roger Brossmer. The full scale Mock-up has remained in storage for decades and the City hopes to preserve and restore the Shuttle by building a permanent facility for the model, which is expected to cost approximately $2 million. The Shuttle will remain under a temporary tent until the City has the funds necessary to construct a permanent building to house the Shuttle. The City hopes that with the help of sponsorships, it will be able to raise funds. The new Shuttle building would be adjacent to the Columbia Memorial Space Center, the City’s own hands-on learning center dedicated to teaching children about science and space exploration. “Having this exciting Shuttle Mock-Up attraction next to the Columbia Memorial Space Center will not only help further the Space Center’s educational programs, but it will provide visitors with a unique experience that will help engage and inspire the next generation of explorers,” added Mayor Roger Brossmer. Craig Cocca has shared some photos he took today of the area where the original 1972 space shuttle mockup will be moved in Downey. Here are some photos that I took early this morning at the old Downey plant of the tent being erected where the DEI Room mockup will be displayed while the Columbia Science Center and City of Downey raise the money for its permanent display pavilion. I have also included a picture of the hole they cut in the side of Building 1 to extract the mockup. The original full-scale mockup of the space shuttle, which hasn't seen the light of day since the early 1970s, emerged from a warehouse into the California sun on Thursday (July 12) to be put on outdoor display. 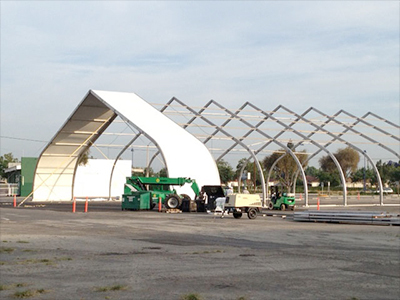 The full-size wood and plastic model was transported on a flatbed truck the short distance from the building where it for decades served as a design and demonstration tool to an open-ended tent that was erected in a parking lot near the Columbia Memorial Space Center in Downey, Calif. The Downey Beat also reports on the shuttle's move, highlighting the history of the mixed-race workers who built the mockup. Did Grumman ever make a full-scale mockup? Cradle of Aviation Museum in Garden City had in the mid-80s a mockup of a space shuttle. Not sure who made it — presumably it was the Grumman proposal — or where it went. The mockup, now fully moved (credit: Columbia Memorial Space Center). We want to thank all collectSPACE'rs who came by today. Now our job really begins — we need to raise $5 million to build the building to house it. This will include a facility to honor the Apollo crews, especially Apollo 1. We want to tell the stories of what happened and how we recovered to go to the Moon. We put Apollo boilerplate 19 inside the tent today. We are looking for sponsors also. We will soon offer financial contributors a sneak peek and allow them the chance to go through the flight deck and mid deck and cargo bay — which you can't do on any real bird! It was great to see the Rockwell mockup see the light of day again. For some perspective, the last time I saw it was at the Rockwell open house in 1990...it was kind of like seeing an old friend! I think the display pavilion needs to get built as quickly as possible. Time has clearly not been kind to this artifact (a friend of mine noted that the mockup appears to have the same amount of wear-and-tear as one of the reentry-scarred flightworthy orbiters). It also looks a bit odd under the tent with the vertical stabilizer and one wing missing (something that was less obvious in the DEI room because the ceiling and back wall created a very natural reason for those pieces to be missing). I emailed the Columbia Science Center, the City Manager, and the Mayor's office last week to suggest the idea of "crowd-sourcing" the funding for the display pavilion. I think a project on Kickstarter or DonorsChoose that is built on the concept of creating a learning experience for children with the mockup as the centerpiece would result in the funding being quickly raised, especially if 2-3 large donors, IRG Realty, and the City can be made to provide matching funding for each dollar donated by the public. Is that a mockup of an EDO kit sitting next to the orbiter? Yes Jay, that was the Extended Duration Orbiter (EDO) prototype mockup. This one was very close to flight worthy (I've been told) but as we went ahead with the ISS only one EDO pack was needed and STS-107 was to be its final flight. It was lost with Columbia. Be a part of Downey's history by helping to name the City's very own Space Shuttle Mock-Up, currently on display at Downey Studios, 12214 Lakewood Blvd. The Space Shuttle Mock-up is owned by the City of Downey and has the distinction of not only being the first full-size Space Shuttle ever built, but it was used for two decades for detailed engineering fittings and testing. The full scale Mock-up has remained in storage for decades and the City hopes to preserve and restore the Shuttle by building a permanent facility for the model. The new Shuttle building would be adjacent to the Columbia Memorial Space Center, the City's own hands-on learning center dedicated to teaching children about science and space exploration. History is in the making so be a part of this amazing time in the City of Downey by submitting a potential name for this historic Shuttle. The winner will be recognized at a City Council Meeting and invited to the Ribbon Cutting Ceremony as a special guest of the City Council. The Los Angeles Times reports on the status of Downey's space shuttle mockup, which was named "Inspiration" in September 2012. Inspiration is a full-scale space shuttle mock-up — largely made of wood and plastic — that Rockwell built in 1972 to show what it would look like before the program was approved. 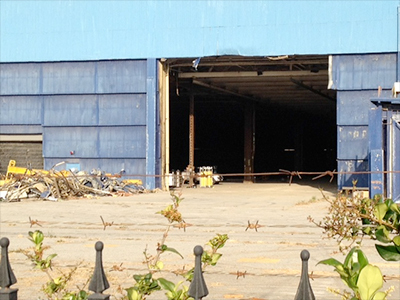 In recent decades, the 122-by-78-foot model remained hidden away at the former manufacturing site. The mock-up is on display a few hundred feet from the museum but will soon be moved into storage again because of a lack of funds. In 2012, the city estimated it would cost $2 million to properly exhibit the mock shuttle, more than 21/2 times the entire budget for the museum in 2013. Sorry to hear this. I was looking forward to seeing this shuttle get a proper home for public display. Thanks for keeping us updated! I had been wondering about it. Yes, I was hoping not to write this but it is sadly true that the first shuttle mockup is to be removed from its safe, indoor location shortly to an outside city facility (storage) until the city can get 3 to 5 million dollars to build a permanent building. I have been on a board of advisors to the city during my illness — but there has been only a couple meetings in the last year! My calls to the city fathers have not been returned. I really wish I could have done more. My guess is, with Endeavour nearby in LA, they must think why bother with displaying a mockup when one can see the 'real' thing up close. Shortsighted, but true in this penny-pinching age. Hopefully it can be shown one day as part of the area's aerospace heritage. I have a call into a councilman, but the orbiter has been removed from public view and taken to a city yard where it will remain outside but under plastic, until the city decides what to do with the artifact. The fact that such an important artifact may be destroyed by weather because it cannot be enclosed for $3 to $4 million permanent building is such a shame. An alternative, pending its final fate, would be a warehouse leased to the city, or even an airport hangar nearby; surely something can be done to accommodate it and save it from the elements. It would be far more expensive to let it disintegrate and then restore it than to pay any storage fees. Maybe on a 'loan' to an aerospace museum? Perhaps one of the places that didn't get a shuttle or a mockup would express their interest in getting this?